In order to participate in HandsOn Connect (the "Service"), you must provide a limited amount of information so that HandsOn Connect and community organizations that you would like to work with may contact you. During registration, or through your Account Profile, you may choose to "opt out" of receiving communications from HON or your local Volunteer Center or "opt in" to receiving communications from third parties about volunteering and other, non-volunteering, opportunities or activities. We WILL NOT provide your personal identifying information (e.g., name, contact information or volunteer information) to third parties who are not Authorized Users of the HandsOn Connect service (e.g., non-profit organizations and Volunteer Centers), unless you indicate otherwise. In addition, HandsOn Connect collects certain information, which cannot be used to personally identify any user ("Non-Personal Data"). Non-Personal Data ordinarily includes aggregate, summary, or other anonymous data, and may include, by way of example, statistics regarding total registrations, total number of volunteers matched to opportunities, popularity of particular pages within the Site, or information regarding types of Internet browsers used by Authorized Users. We also collect Non-Personal Data about each Authorized User's IP address to help diagnose problems with our server, and to administer our web site, but such IP addresses are not associated with individual account profiles or registration information. When using the Service, we may create "cookies" on your computer for purposes of facilitating and maintaining your current user session, and may collect Personal Data using those cookies in order to enable HandsOn Connect to identify you in connection with the Service and to track use of the Service for purposes consistent with this policy. Any Authorized User providing Personal Data is certifying that he/she is over the age of 14. As such, we do not collect or maintain Personal Data from individuals we actually know are under 14 years of age, and no part of our Site or Service is designed to attract people under the age of 14. Protecting the privacy of children is very important to us. Thus, if we ever obtain knowledge that a user is under the age of 14, we will take steps to remove that user's Personal Data from our databases and to prevent the user from utilizing the Site and the Service. HandsOn Connect uses the Personal Data of Authorized Users as needed to provide the Service, to recruit volunteers for community events or service opportunities, conduct searches for potential volunteers and to communicate with Authorized Users. We also use both Personal Data and Non-Personal Data when evaluating ways to improve the Site and the Service. As further described below, we may disclose collected information, including Personal Data, to certain third parties in connection with providing the Service or as required by law. We will not use or disclose collected information in ways substantially different from what is described in this policy, unless otherwise required by law. HandsOn Connect also uses information collected through the Site and the Service to communicate promotional information to Authorized Users ("Promotional Information"). Promotional Information may include materials about volunteering, your local Volunteer Center and the HON, nonprofit organizations, government agencies or community businesses participating in the Service, and/or about our business partners and affiliates. HandsOn Connect will refrain from sending Promotional Information to Authorized Users who "opt out" of receiving such information. HandsOn Connect offers all Authorized Users the opportunity to recommend the Site and Service to others. If you provide any such recommendations, please note that we will identify you by name as having made the recommendation. Also, we may attempt to contact the individual and/or entity through e-mail(s) in order to invite them to visit the Site. We also provide these contacts with the opportunity to "opt-out" of receiving Promotional Information. HandsOn Connect will respect your preferences, as you may indicate to us in your Account Profile (further described below), regarding whether it is permissible for us to make disclosures of Personal Data other than the disclosures described above. If you indicate in your Account Profile that we may make such disclosures, depending upon your selections, your local Volunteer Center and the HON, may contact you to provide information about volunteering (these communications should not include solicitations for funds or other support). Additionally, if you so select, the Service may contact you on behalf of business partners and sponsors of HandsOn Connect with information about goods or services they provide, which if purchased, also provide financial support to the Service. Because HandsOn Connect respects your privacy, we provide certain opportunities for you to indicate your preferences regarding how we use and/or disclose information collected about you from the Site and the Service. Each Authorized User will have an Account Profile, which among other things, allows Authorized Users to indicate their preference to "opt out" of receiving volunteer information from HON or your local Volunteer Center, or "opt in" to receiving communications from business partners and sponsors of HandsOn Connect. Each Authorized User may indicate such preferences during the initial registration process, or may visit the "My Profile" section of the Service to update their preferences. The Site may contain links to other web sites, including those that may have their own posted policies regarding the collection and use of your personal information. HandsOn Connect is not responsible for the privacy practices or the content of such other web sites and we encourage our users to read the privacy statements of every web site before providing any personal information. Each Authorized User selects a unique username and password that enables his, her or its access to the Service. We monitor the use of the usernames and passwords in order to collect and maintain records of all individual transactions conducted through the Service by Authorized Users, and those records are associated with each Authorized User's individual "Account Profile" within the Service. Authorized Users may access their Account Profiles at any time to update Personal Data contained within that Account Profile. Subsequent uses or disclosures of information by HandsOn Connect will reflect those changes. Certain information is necessary in order for HandsOn Connect to provide the Service; therefore, if you delete such necessary information, you will not be able to use the Service. The Site has security measures in place to protect against the loss, misuse and unauthorized alteration of Personal Data in HandsOn Connect's possession and control. We use our best efforts to ensure that all sensitive information provided by Authorized Users will be encrypted with industry standard encryption techniques. When you are viewing a secure page within the Site, such as our user registration form, an icon of a padlock will appear as "locked" at the bottom of web browsers such as Netscape Navigator and Microsoft Internet Explorer, but the same icon will appear as "un-locked" when the user is merely "surfing" nonsecure pages on the site. We currently use an encryption program known as "SSL," or "Secure Sockets Layer." To learn more about SSL, go to http://www.ssl.com/. Furthermore, access to Personal Data is physically restricted within HandsOn Connect"s own offices and facilities. Therefore, HandsOn Connect"s employees are granted access to your Personal Data as necessary to perform specific jobs and tasks (e.g., performing customer service). Please be aware that, although we endeavor to provide reasonable security for information in our possession and control, no security system can protect against all potential security breaches. Furthermore, Authorized Users are responsible for safeguarding the confidentiality of passwords to the Service. If you have any questions about our security measures, please contact us using the "Contact Support" link at the bottom of each page of the Site. VOiCEup Berks is committed to preserving the privacy of its volunteers and visitors to this website. Access to volunteer and visitor information will be limited to VOiCEup Berks staff, project leaders, and others involved with VOiCEup Berks activities. Volunteer and visitor information will not be otherwise shared, given, loaned, or sold to any other individual or organization. 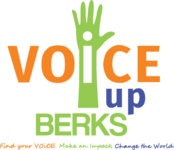 The information provided by volunteers and visitors will be used by VOiCEup Berks to coordinate and track volunteer projects and to communicate with VOiCEup Berks visitors and volunteers about VOiCEup Berks opportunities and activities. Such information will not be used for commercial, personal, or unlawful purposes. If you have any questions or concerns, or if you wish to unsubscribe, please email us at info@voiceupberks.org.